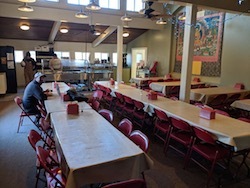 The dining hall at SMC is one of the key spaces used by all staff, visitors, guests, and program participants. The kitchen and dining hall serve our community in a variety of ways every day, and improvements to that space will have a lasting benefit to our community. By providing a certain decorum and professionalism we’ll be better suited to cater to the needs of our participants and programs. 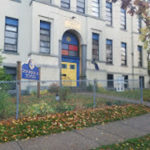 Funds are being requested to replace the tables and chairs in the dining room. The tables will be high-quality commercial grade walnut top tables, and the chairs will match the tables. In this effort, by slightly shifting the dimensions of the tables, we will free up a small amount of space to create a more comfortable configuration for the tables and for the traffic flow in the space.